"The Golden Compass" builds a gorgeous universe full of action-packed adventures. Unfortunately, those adventures are mostly happening far offscreen -- and the characters you do meet spend most of their time describing them. The film -- adapted by writer/director Chris Weitz from Philip Pullman's novel -- concerns a passive young orphan named Lyra (Dakota Blue Richards) who lives on a college campus in an alternate-universe England. The particulars of this alternate universe are realized with all the gorgeous CGI that (at least) $150 million can buy. People fly around in Jules Verne zeppelins and use all kinds of steampunk technology. There is, for some reason, a kingdom of talking polar bears to the north, living in what looks like the most barbaric Coke commercial ever filmed. And, coolest of all, people's souls manifest at their sides as talking animals called "dæmons"; children's dæmons shift shape at will, and it's all beautifully animated. Lyra gets taken to various exotic locales by older, cooler characters who tell her their exciting stories and then promptly disappear. Lyra occasionally looks into a sort of super-secret clockwork Game Boy called an "alethiometer" and catches glimpses of exciting stories involving those same older, cooler characters. Lyra talks about "gobblers" who kidnap children for "City of Lost Children"-style medical experiments. We barely see it happen. A gang of gypsy pirates sits around a table and talks about war and history and how the alethiometer works. In fact, the workings of the alethiometer are explained at least three times, and I still don't quite get it. We glimpse an army of witches flying off to a war we never see. One witch (Eva Green) shows up on a boat and tells Lyra a long story and then promptly flies away. A sinister socialite named Mrs. Coulter (Nicole Kidman) takes Lyra for a blimp ride and tells her a vague tale about the Fall of Man. Someone tells Lyra that her explorer uncle (Daniel Craig) has gotten into violent trouble in the Arctic and is bribing his captors and has set up a secret laboratory to study a mysterious substance called "Dust" that opens a door to other parallel universes. Uh, can I watch the movie where all this referenced action is happening onscreen, please? The movie improves a little after the late arrival of a polar bear voiced by Ian McKellen and a pilot played by Sam Elliott. (You haven't lived until you've heard Elliott growl through his mustache, "If I was on the kind of scout you're on, I'd have myself an aeronaut and an armored bear.") And there is one big battle at the end of the movie, but Weitz seems to regard combat as an impediment to further exposition: His idea of an action scene is to point the camera in a general direction and turn up the music. That "Narnia" movie was lame, but at least its final battle was vaguely cinematic. 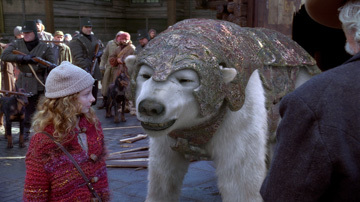 "Golden Compass" ends up being ridiculously top-heavy -- teetering around trying to explain its vast ideas and world-building mythology without bothering to craft the focused story or lived-in immediacy of Peter Jackson's "Lord of the Rings." If you haven't read Pullman's novel, you feel excluded from the movie's conversations, as if you're watching a "Star Trek" movie where all the characters jabber for an hour-and-a-half about nothing but rerouting the warp engines through the deflector dish to create a tachyon pulse. By film's end, I realized why producer New Line recently started talking publicly about hoping to make "The Hobbit" with Peter Jackson despite the fact that he's suing them. Oh, and the very ending just drove me nuts. SPOILER ALERT: A promising team of oddballs has finally been assembled in a cool vehicle, and they're all flying off to a grand reunion -- and Lyra just starts talking and talking and talking about all the mind-blowing things that are going to happen, and then the movie suddenly just up and ends (again, a little short of where the book ends). It's unbelievable -- as if "Star Wars" ended the second everyone first boarded the Millennium Falcon. During her endless final speech, Lyra also recaps the story thus far and concludes, "That's an awful lot to sort out." Jesus, is it ever. C; 113 minutes; rated PG-13 for sequences of fantasy violence. Those were EXACTLY my complaints! I was so ready to love The Golden Compass - the art direction, the atheist angle, the Alexandre Desplat soundtrack, Nicole Kidman, Sam Elliott -, but this wasn't even a movie, this was... an illustrated book review or something. They had all the money in the world to make this any way they wanted, but it plays like low-budget soap opera where every character talks and talks about what happened to them just around the corner. Thanks for finding the words for what left me speechless, Mike. Excellent piece!